The Nigerian Civil Aviation Authority (NCAA) has warned air travellers in Nigeria that flights would be disrupted due to harmattan haze, which has already led to flight cancellations and delays. The regulatory body said the warning was necessary because cancellation of flights by airlines due to unfavourable weather has led to altercations and sometimes violent protests by passengers. In the previous years, airlines staff had been hounded during the yuletide by passengers who were eager to get to their destinations to enjoy the holidays, so NCAA has urged travellers to recognise and respect airlines' decision on flight cancelation and delays. "This advice is important due to the spate of delays and cancellations occasioned by inclement weather en route most of the nation's airports. During the week, most parts of the country witnessed adverse weather conditions which prevented most scheduled and non-scheduled flights from providing services," noted NCAA in a statement signed by its spokesman, Sam Adurogboye. Earlier, the authority had issued weather alert circular to all pilots and airline operators on the impending adverse weather, which forewarned all operators on the inherent danger associated with harmattan haze as regards flight operations at this time of the year. "Therefore, the prevailing weather condition is likely to herald a long and severe dust in the months ahead. 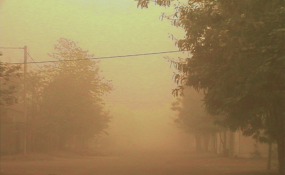 During this period, air- to - ground visibility may be considerably reduced due to the dust haze. "In addition, aerodrome visibility may fall below the prescribed minima due to the severe conditions. Dust haze can blot runways, the markings and airfield lightings over wide areas. These make visual navigation extremely difficult or impossible. Under these kinds of adverse conditions, air travel is bound to suffer delays and cancellations," the regulatory body said. NCAA therefore advised passengers to exercise restraint when their travels suffer these fates because pilots are merely observing what is contained in the departure, en route and destination weather which might sometimes necessitate outright cancellation. "When these happen, the airline and the pilots are strictly adhering to the Standard and Recommended Practices (SARPs). So operating airlines are expected to share as much information as possible with passengers on the progress of their respective flights in line with the Nigerian Civil Aviation Regulations (Nig.CARs) 2015 Part 19," NCAA said.